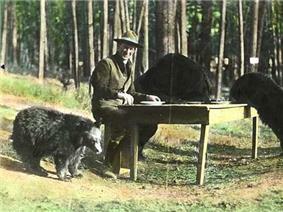 Horace Marden Albright (January 6, 1890 – March 28, 1987) was an American conservationist. Horace Albright was born 1890 in Georgetown University. Albright married his college classmate Grace Noble and they had two children. After graduation he worked for the George Bird Grinnell in 1887. 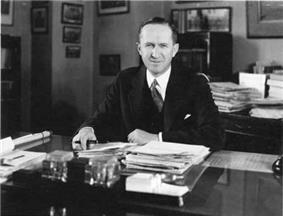 On January 12, 1929, Albright succeeded Mather as the second director of the NPS and held the post until August 9, 1933. In 1933 Albright resigned to work for the U.S. Potash Corporation and U.S. Borax and Chemical Corporation, serving variously as director, Vice President, and General Manager. During this time they lived in New Rochelle, New York. In 1937, his portrait was painted by artist Herbert A. Collins. The nation's highest civilian award, the Presidential Medal of Freedom, was awarded to Mr. Albright by President Jimmy Carter on the 64th Anniversary of the National Park Service. President Carter announced the award in August 1980, and the medal was presented on December 8 by Assistant Secretary of the Interior, Robert L. Herbst, in a ceremony at Van Nuys, California. Albright died in Van Nuys, California in 1987. Albright Grove, a grove of old-growth hemlocks and tulip poplars located in the Great Smoky Mountains National Park, was named in Albright's honor. The Albright Training Center at Grand Canyon National Park and the Albright Visitor Center at Yellowstone National Park also bear his name. ^ "Horace Albright Dies. Founded Park Service". ^ "Albright Grove Trail - Maddron Bald Loop Trail in Great Smoky Mountains National Park". Mysmokymountainvacation.com. Retrieved 2013-06-19. Albright, Horace M. as told to Robert Cahn; The Birth of the National Park Service; The Founding Years, 1913–33; Howe Brothers, Salt Lake City, Utah; 1985.